We're trying something brand new here at Top Tier Board Games - a Team Trios tournament featuring Standard, Modern, and Pauper! Along with two other players, your team will face off against another team of three, with each member of your team playing a deck from a different format! Bring your best Pauper, Standard, and Modern decks to crush the competition. Entry will be $20 per player, and 8 packs will be in the prize pool per player! This tournament will be run at Competitive REL, and decklists will be required. A decklist can be downloaded at the link below, or decklists will be available on the day of the tournament. Please note at the top of your decklist which format you are playing. The tournament will consist of a maximum of 5 Swiss rounds, with a cut to the top 4 teams. Preregistration is available at our website below. There is a player cap of 60 players (20 teams) for this tournament, so be sure to register early! Please note your teammates when registering. The player meeting starts at noon, to be followed immediately by round one! 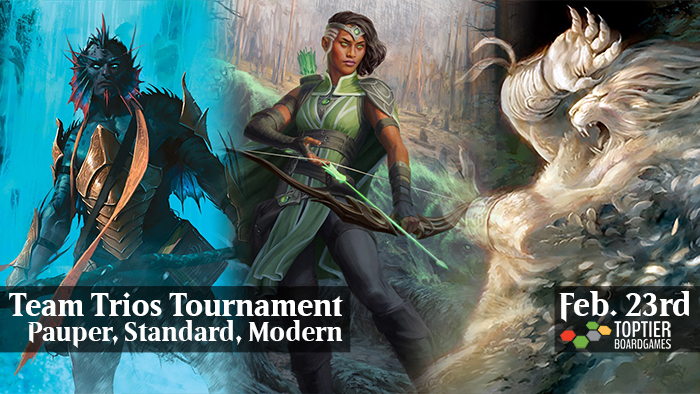 Standard and Modern will follow their usual banlists and construction restrictions, with Pauper following the Magic Online banlist and construction requirements, linked below. Notably, there are some cards printed at common in paper that were never printed at common online (e.g. Sinkhole). Those cards will not be allowed despite being available as commons in paper. The Modern player will have the center seat in the team. Communication between team members is allowed and encouraged, however teammates may not touch each other's cards. Looking for teammates? Feel free to post in the Discussion section of the Facebook event!